I was on a health kick last year and found this yummy recipe. Well, the health kick is over, but the dish is so good, I still make it for dinner. This is a great weeknight meal to make. To make this easy meal even easier, you can prepare the chicken the night before, put it in the fridge, and cook it when you get home from work. A great homemade weeknight meal that’s good for you, tasty, and looks like this? 1. Start cooking the brown rice as directed on the packaging. Mine usually takes about 50 minutes to fully cook. 2. Preheat oven to 350. Bake sesame seeds, stirring frequently, for 5 minutes or until toasted. Set aside to cool. Raise the oven temperature to 400 degrees. 3. 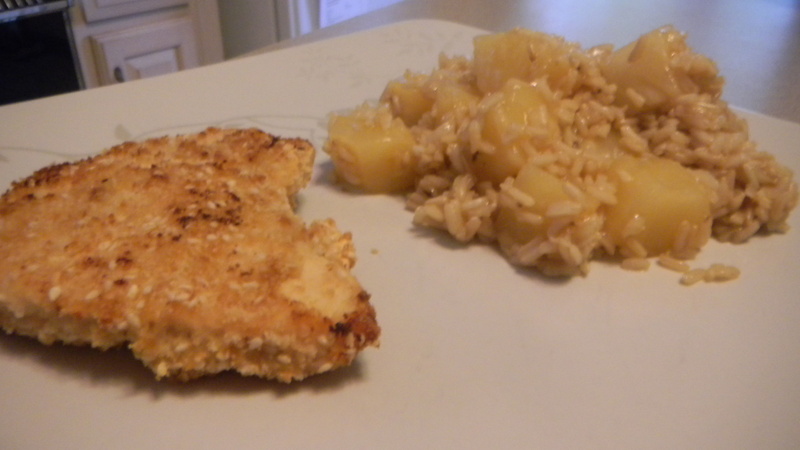 Combine sesame seeds, breadcrumbs, and ginger in a shallow bowl or pie dish. 4. 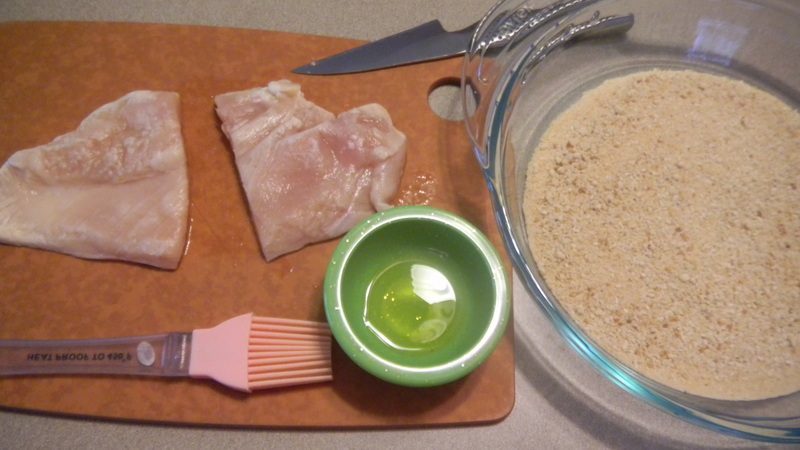 Using a brush, coat the chicken with olive oil, then sprinkle chicken with salt. 5. 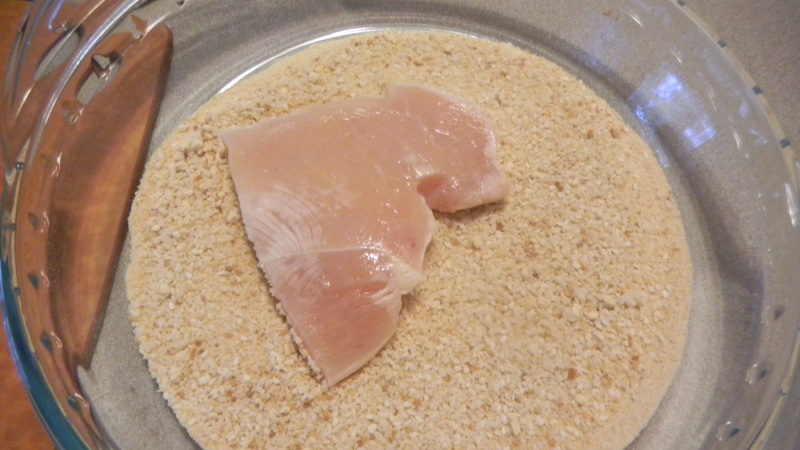 Dip the chicken into the sesame seed mixture, making sure both sides are well covered. 6. 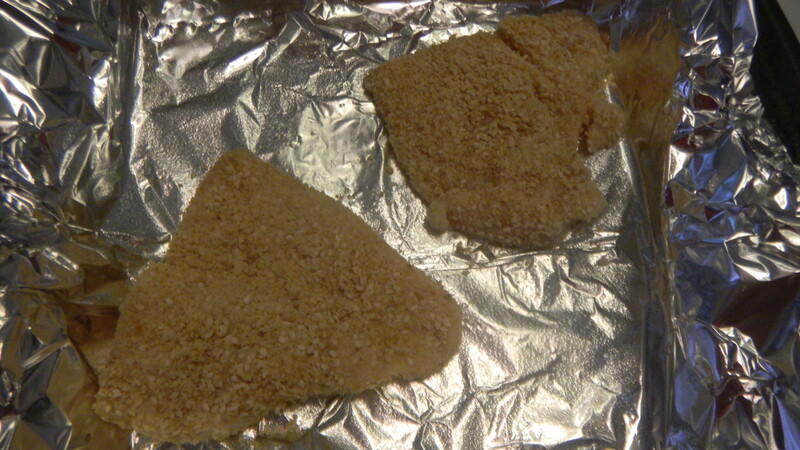 Place foil into a baking pan and spray it with nonstick cooking spray. Place the chicken in the pan and bake for 20 minutes. 7. While the chicken is baking, make pineapple rice: Heat olive oil in a large nonstick skillet over high heat; add pineapple and green onion. Sauté for 1 minute. Reduce the heat to medium-high; add cooked rice and sauté for 3 to 4 minutes or until hot. Stir in soy sauce and sesame oil. This recipe makes enough for Dan and I for dinner with enough leftover for lunch the next day. Try it out.